By learning to explain how connections help readers understand texts, comprehension improves. 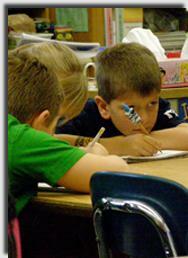 Children deepen their understanding by accessing their prior knowledge before reading a selection. Students practice thinking about what is misunderstood and applying what they know to repair meaning. They learn to apply connections to get meaning from a selection that was originally confusing. Students begin to dissect and discuss author’s literary elements - like metaphors - to deepen their comprehension even further. A big part of learning to use connections is learning to compare. I can recognize when I’m confused. I can recognize when I stopped paying attention. I can take action to repair broken comprehension. I can overview to boost my comprehension. I can explain how connections help me understand the text. I can recognize connections that help and connections that take me off track. I can use sophisticated connections - like literary elements, comparing, and contrasting – to help me interpret the author’s words. I can use my connections to help me understand test passages and questions. When coaching, teachers tell me, “Oh, connections? My kids got that.” But, do they really? Do students understand how to use what they know to figure out what’s confusing? Do they even RECOGNIZE when the book stopped making sense or they started daydreaming? If they do notice, do they know what actions to take to repair the breakdown? Or, do teachers mean that their students can name text-to-text, text-to-self, and text-to-world connections? Consider this connections-unit checklist of all that needs to be modeled, progress monitored and evaluated. If your students are like mine, they haven’t even seen, much less named, these behaviors. What would happen if we asked shoppers to park their cars at Wal-Mart at Christmastime without lines painted on the pavement? Eventually, customers could park, but can you imagine the mass confusion? So, why ask them to? Similarly, students need to find a parking space in their brain before they read in order to store information efficiently. By simply overviewing a selection, readers tell their brain, “Okay. This text is about this topic by this author and it’s written in this text structure. I should store it with other information like it.” Just like the driver who knows where to park, the reader takes a minute to find just the right spot in the brain for the topic. In other words, if students learn to preview, they are more likely to store the new information gained from reading in long-term memory and more important, retrieve it later. Without taking the time to think about the text before reading, the brain is more likely to lose the new information just like the drivers who won't be able to find their cars. Make pictures of the script in your head as you read. If the movie stops, the reader is confused. Readers take steps to get unconfused right away. At that point, they either stop and think, take notes, reread, look up a word, or talk to someone. Bottom line? They do something! Practicing connecting supplants naming connections as part of our evolving understanding of the proficient research. Inexperienced readers often don't know what to do when they trip over an unfamiliar word. If we teach readers strategies for figuring out the pronunciation, they usually know the meaning. We must teach readers strategies for decoding new words: to find a similar rhyming pattern, beginning sound, part within the word, or memory of where they've seen the word before, for example. Reading is not all about unfamiliar words either. Sometimes, students can read every word but do not comprehend. Using connections is a powerful strategy to use when learning to figure out different levels of meaning as well. In my connections unit, I show students how to search for connections, use stored information to figure out what's puzzling, use sophisticated connections to unlock meaning, and explore the difference between connections that help and ones that lead them into a ditch. Use Notice-Wonder charts before and during reading. Recognize their confusion when they can pronounce a word but the meaning is new. Look for multiple levels of meaning through interpreting literary elements like metaphors. Think aloud to discover logical explanations for what's troubling them. Code connections to read more actively and prepare readers for discussion. Question the author to understand main ideas, themes, and author’s purpose. Stop and Think by dividing reading into sections, stopping, and talking with a partner. Use exit sheets to record thinking at the end of each lesson and reread the reflection as a starting point the next day. Interpret test language to be better test takers. You can see from this extensive list that we have a lot to teach. So, don't worry anymore about whether students can name text-to-text, text-to-self, or text-to-world connections. These skills don't help students comprehend more deeply, and learning them takes time away from reading. However, you will want to devote 4-6 weeks to helping your readers develop a rich understanding of using connections appropriately with lessons similar to those posted on this site. Even so, no reader totally gets connections even in that short amount of time. Making connections is a study that will continue from year to year and will last a lifetime - just with harder texts. In the past twenty-five years, reading research has provided valuable insight into the thinking processes of proficient readers, revealing remarkable consistency in the strategies they use to comprehend. One of the most significant areas of research has been in schema theory, which “tries to explain how we store our knowledge, how we learn, and how we remember what we have learned” not just in reading but in all areas of learning.